Based on the responses there seems to have been a strong overall response to the idea or, at least, delayed skepticism. In an effort to better test the auction features an initial beta test was set-up. The auction software certainly had some areas for concern, and several collectors raised valid concerns too. – The Software. The current version of the software is the most limiting. Sadly, purchasing the upgrades for the software would not make significant improvements. However, if it appears that the auction feature would be used even occasionally, then it may be worth purchasing. – Sellers. Vetting of sellers would be 100% possible. – Bid Increments. I need some input from the bidders of the beta auction, but I believe the bid increments are limiting. So if Bidder 1 enters a bid of $50 as the first bid and the opening price is $10, then Bidder 2 will have to bid 5 times to outbid Bidder 1. Is that correct beta test bidder? – Payments. It looks like there is a good deal of flexibility with payments. It may be possible to use a few different methods, including checks. – Feedback. There wouldn’t be a set system. However, feedback could be incorporated into the UofM website through several options. 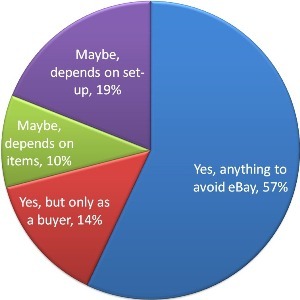 Buyers and sellers would also be able to pull feedback from eBay and LRG. It has been said several times that the UofM auctions would not replace eBay. However, this feature may provide a specific option for collectors looking to sell specific collector-centric items. Hopefully a very basic, but live, auction will be set-up in the near future. A registration post will likely foreshadow the upcoming auction. And please remember, this first auction will be a test. There are likely to be a few issues, but it will be the only way to practicality vet the UofM Auctions. This entry was posted on Thursday, January 27th, 2011 and is filed under UofM News. You can follow any responses to this entry through RSS 2.0. You can skip to the end and leave a response. Pinging is currently not allowed.